1 Blemished Available: $107.98 This item is available as a Blem/Refurb. These are items that cannot be sold as "New" merchandise and are limited to stock on hand. See the product details for a description of the product's condition. Like any worthy rebel, the LS2 Rebellion Helmet stands alone and charts its own course. With a stylish shell made of high performance, lightweight Kinetic Polymer Alloy (KPA), the Rebellion has just the right blend of retro-cool with a technical edge. Imagine a half-shell motorcycle helmet that offers flow-through, ported ventilation to keep you cool on the hottest days. The short peak and Twin Shield System drop down sun shield will protect your eyes when the sun is in the horizon. The sun shield itself has unique, two-stage adjustability: lock it half way for just a little shade or full open for total sun protection. The dual-density EPS meets / exceeds DOT standards for 50 state legal protection. The LS2 Rebellion Helmet is finished off with a micrometric, quick release chin-strap and set up for easy and seamless installation of the LS2 LinkIn Bluetooth communication system by Sena (sold separately). If you’re the type who sets your own course, the LS2 Rebellion Helmet was designed for you. The first helmet I received had a misadjusted strap, I returned it and RevZilla replaced it at no charge and even covered shipping. LS2 quality control lacks but RevZilla made up for their short comings. Outside of that I love the helmet, it looks good, kind of like a bicycle helmet. No mushroom head. Great fit and comfort. I highly recommend it and I highly recommend RevZilla! The best online motorcycle shop out there! I really like this helmet! This is my first LS2 helmet purchase and I'm very impressed. Very comfortable and I really dig the thinner profile which significantly eliminates the big bobble head look common with most traditionally designed helmets. While I prefer the traditional double D ring chin strap over the quick release on this helmet it's not a deal breaker by any means. I like the visor a lot but quickly discovered that I prefer wearing my clear lens riding glasses (Bilt S2's) in conjunction with the visor, especially around 50 MPH and above due to air circulation up under the visor. One thing about sizing on this helmet: If you are within 3/8" or even a 1/2" inch from the maximum circumference on the size chart, consider moving up to the next size. Overall I'm very happy with this helmet! THIS IS MY 3RD LS2 HELMET. THE OTHER 2 ARE STROBE MODULAR. WITH THE STROBE, MY HEAD SIZE FALLS BETWEEN THE LARGE AND XL. SO I ORDERED THIS HELMET IN A LARGE. IT WAS WAYYYYYYY TOO LOOSE!!! I REORDERED THE MEDIUM AND EVEN IT WAS SLIGHTLY LOOSE, BUT NOT SO MUCH AS TO BE UNUSABLE. I WOULD SUGGEST ORDERING ONE THAT IS ONE SIZE DOWN FROM WHAT YOU HAVE BEEN WEARING IF YOU HAVE BEEN WEARING FULL FACE / MODULAR LS2 HELMETS PRIOR TO THIS ONE. I USE THE LS2 STROBE FOR MY LONG DISTANCE TOURING AND THE LS2 REBELLION FOR SHORTER BACKROAD CRUISING AND MY IN TOWN COMMUTE. LOVE LOVE LOVE THIS REBELLION HELMET! This helmet is pretty great besides the visor. the way its shaped the air flows right up under it straight into your eyes, even when wearing glasses under. Also, its to close to the face and rubs up against the brim of your nose and side cheeks. This is my first half helmet so I'm not comparing my experience with any other half-helmets. I purchased a medium based on previous reviews stating they run large. I'm normally a large but the MD turned out to fit just right. My head is measured 58-59cm. It's well padded and comfortable. It's not too large in size or weight in my opinion. I haven't used the ear insets, so I can't attest to their noise blocking, but since I wear ear plugs, any advantage they provide wouldn't make much of a difference for me The black chrome finish is beautiful but gets marred quite easily (no exaggeration). On speeds above 40mph I have noticed the helmet has a tendency to lift which I've read is common with half-helmets in general. It's not too bad, and can be corrected if you tighten the strap, but that might cause you to choke yourself slightly. It has great airflow, although I haven't played with the vent to test if it actually works when opened or closed. The visor does a great job of not allowing light to penetrate when used, and there seems to be enough space for me to wear moderate sized glasses. Overall I think this was a good purchase, and if I had to do so again I would have just purchased a different finish. I really wanted to love this helmet but it's just not happening. Some of it is LS2's fault, some of it mine. It took four tries. First one XL, the visor broke out of the box. I did try it on and it felt a bit loose, so I exchanged it for a L.
This one was in perfect new shape. After 2 months of wearing it around the house to break it in (it has been a long winter) it was just not loosening up and I was getting major forehead hot spots. The fourth one came intact, but the visor is rattling. LS2--the visor on this helmet HAS to be reengineered. It's not LS2's fault my noggin is exactly between a L and XL, but that's where we stand. It rides up pretty hard at 50+ mph. The drop down visor isn't bad, but it isn't great either. If the nose cut or upside down 'V' were a little less pronounced, it would be better. It does come into my field of vision just a bit. The straps are good, but if you use the LinkIn Ride Pal, things get bulky very quickly. Also, noise is a problem with the Ride Pal, but it's a half helmet. You're going to get wind in your face. Most everything negative about the helmet I would be able to overlook if it just fit my head better. I'll keep it around for back-up purposes, but I really don't see it getting much use. I really wish LS2 would combine the look and style of the Rebellion with the Bobber--kind of like a Shoe RJ Platinum. I'd give a helmet like that try in a heartbeat! As others have noted the visor was broken during shipping. Unless this is fixed I would suggest buying in person. Wanted a half helmet that was DOT approved. Design,ergonomics. A good looking half face helmet is seldom found . I like the styling. Not your typical run-of-the-mill half or 3/4 helmet. it appears to be the most compact half helmet on the videos. I am trying to find a comfortable compact DOT helmet and not get mushroom head. I like the style and the drop down shield! Plus it has a vent, on a half helmet! Vented sun shield ratchet chin strap. Ear phone compatible. True to size, I have not had the chance to ride with it yet. But so far from just wearing it around the house to check on the fit, I do have to say it seems very comfortable. I might just move it up to my favorite half, but lets wait to see how it is on a ride. 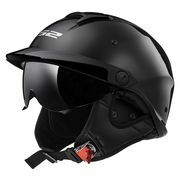 I was looking for half helmet with vents and quick release fastener. Will the sun visor fit over spectacles? BEST ANSWER: I wear large glasses. When the helmet is new, it's tight. But after break in, it gets better. Yes, you can. See answer to question, "Can you have glasses on?" for details. Is the sun visor replacable with a clear visor for night time use? BEST ANSWER: Yes, I keep a clear visor in my saddlebags to switch out. Not a problem switching out. Takes less than a minute. Will Bluetooth pair with phone? BEST ANSWER: 2 lbs, 6 ozs. It's mentioned in the video review provided. Video says it comes with a dark pull down sun visor, do it? can you have glasses on ? BEST ANSWER: Yes you can but they need to stay tight on your face. They may hit the visor if they are not tight to the face. I have not rode with this helmet yet=Minnesota "don't ya know". My reading glasses need to be tight, My cycle glasses are tapered back at the hinges so no problems there. Yes, I wear mine and they are not affected by the helmet. Are the ear pieces removable? BEST ANSWER: Yes they are removable, they are snaps. 3 snaps, and they are wimpy. they do not stay on very well when you spread the straps to put the helmet on. once on they do stay in place. as the straps work in ( soften up) it gets better. Speakers with Velcro backs stick nicely to them. And it cuts some wind noise. Thanks. I ordered one today. Yes, the ear pieces are removable. Will you be able to hear your radio with this helmet? BEST ANSWER: Yes, the LinkIn Ride Pal is designed for it. Word of note--you have to buy the Rebellion designated Ride Pal which comes with new ear covers that the unit fits into. The unit itself is interchangeable for other LS2 helmets. I took mine out of the Rebellion and put it into my LS2 Verso. Worked perfectly. Which way is open for the vent? I find it difficult to tell while riding. Yes, it has ear covers. Does it have the mushroom look? BEST ANSWER: Well, it is better than most but it's not a novelty helmet so it still has a bit of the mushroom look. Comfort is very good though. I would recommend it for that but if you want to not look like a mushroom then your only real choice is a novelty helmet. Thanks Doug for responding. I agree, but am looking for at least the lowest profile DOT helmet with these features, I want my cake and eat it too! That would depend on the size and shape of each person's head. 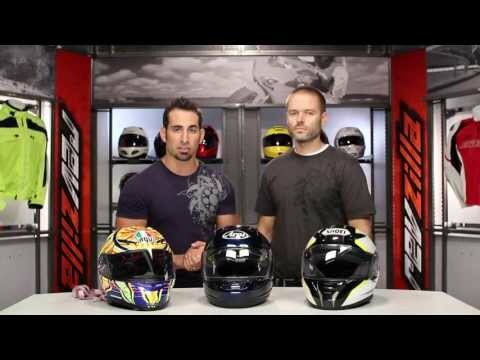 Look at Revzilla's video review. You'll see how it looks when it's on. No i dont think it has that look at all! Thank you Brittany, This as well as the Pit Boss, GMax, and HJC IS, have the features I want but really want a very low profile. Can the peak be removed from the helmet? No but yes has to stay on but is replaceable.